Sometimes supporting your Volunteers means you'll have to troubleshoot authentication issues. Here are a few things that you can try, to help your Volunteers get logged in! Is the volunteer's email address associated with a business or educational institution? Sometimes those types of email addresses block incoming mail from unrecognized sources. In this case, the volunteer may have to ask the controller of their email domain to allow the invitation though. Please check with EverTrue support to confirm if this might be the case. If a Volunteer has requested an access link but has not received it, confirm that they have entered the same email that the invitation was sent to. Ensure that they are using the web address https://volunteer.evertrue.com/ - we recommend that Volunteers bookmark this or add it to their favorites. If your volunteer goes to this URL and does not see their pools or the main Volunteer page (pictured below), their browser may require a full shut down (all windows/tabs closed) and hard refresh. To perform a hard refresh on a PC, press Ctrl + F5 simultaneously on your keyboard, and then reload the page. To perform a hard refresh on a Mac, press Command + R.
The link in the original Volunteer invite email will no longer be valid after the volunteer has accepted the invitation. 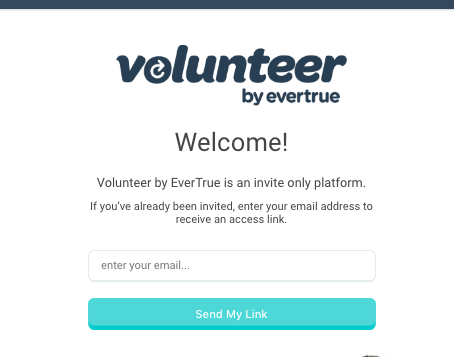 Have the volunteer go directly to https://volunteer.evertrue.com/ to log in, instead of using the link in that email invitation. If your volunteer is still unable to log in, please contact us for further assistance!